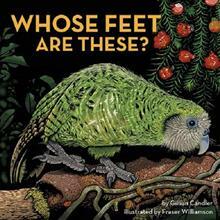 Following on from the acclaimed Whose Beak is This?, author Gillian Candler and illustrator Fraser Williamson turn to looking at feet. In Whose Feet are These?, New Zealand native animals including birds, reptiles, an insect, a mammal and more reveal their feet for children to gu... read full description below. Following on from the acclaimed Whose Beak is This?, author Gillian Candler and illustrator Fraser Williamson turn to looking at feet. In Whose Feet are These?, New Zealand native animals including birds, reptiles, an insect, a mammal and more reveal their feet for children to guess their identity. While having fun guessing whose feet belong to whom, young children will learn an important science concept about adaptation - that animals' feet are adapted to their different habitats and lifestyles. Being encouraged to look closely at the pictures teaches observation skills and helps children discover how diverse our native animals are. GILLIAN CANDLER is an award-winning writer for children. Whose Feet are These? was inspired by children's response to the acclaimed Whose Beak is This?. She enjoys encouraging children's curiosity, observation skills and wonder for the natural world. Gillian has a passion for nature and is an active member of Birds New Zealand and Forest & Bird. Her involvement in conservation projects has seen her identifying geckos, feeding fairy prion chicks, counting birds, making seed balls and trapping pests. Gillian blogs about nature at: explorediscovernature. blogspot.co.nz. She has a background in teaching and educational publishing and believes that picture books can be both fun and educational. FRASER WILLIAMSON is an internationally recognised artist/illustrator whose work ranges from large illustrative paintings to quirky children's books that try to amuse and entertain. Fraser wishes to portray characters and environments that allow for imagination and diversity. His work has featured in magazines, books and ad campaigns, both nationally and internationally, and he regularly exhibits his paintings at the Flagstaff Gallery in Devonport, many of which now adorn walls in Auckland, Melbourne, Finland, Malta and London. Fraser lives in Auckland with his wife Loisi and their son Antonio. They like to spend their time between Tonga, New Zealand and Spain.